Although scaling and root planing is very similar to a regular cleaning, this procedure removes plaque and tartar from the root surface. Scaling and Root Planing is a deep cleaning technique to remove plaque and tartar from areas beneath the gums. This technique helps restore health to your gums and teeth and is commonly used to treat periodontal disease. In some cases, following the procedure, antibiotics may be placed in the periodontal pockets to control the infection and encourage normal healing. Scaling removes plaque and tartar from the tooth surface, focusing around and just below the gum line. This procedure is usually completed with the use of an ultrasonic scaling tool and or manual instruments. Plaque and tartar act as a barrier, blocking the roots from attaching to the root surface. Root Planing removes plaque and tartar from the root surfaces, which allows the gum tissue to firmly reattach to the root surface. Patients that successfully respond to treatment will experience a decrease in the bacteria present in their oral cavity, which call also prevent disease and the spread of the bacteria to other areas of the body. 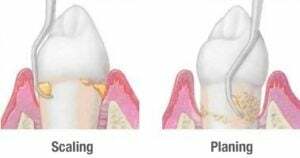 Scaling and Root Planing also protects against tooth loss and lowers the risk for periodontal disease. In addition to a patient health, scaling and root planing may also improve the cosmetic look of the mouth, whitening the teeth, and improve bad breath.